The ruling Liberal Democratic Party on Sunday adopted a concise plan on its long-cherished goal of revising Japan's pacifist Constitution at its annual convention, apparently in consideration of local and national elections later in the year. In his address, Prime Minister Shinzo Abe, who is the LDP president, reiterated his strong desire to amend the supreme law by clarifying the status of the Self-Defense Forces in the war-renouncing Article 9 to end academic debates over their constitutionality. 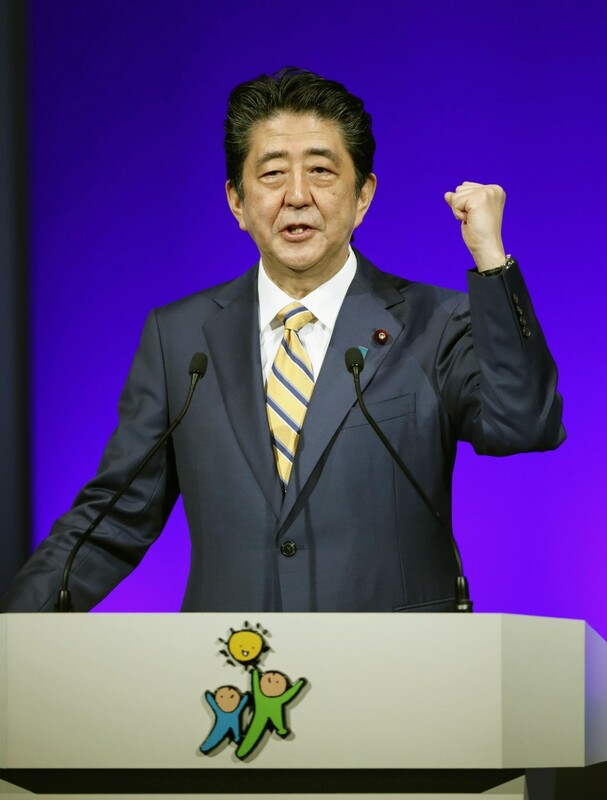 "Finally, it is time to work toward the constitutional revision, which has been our dearest wish since the establishment of the party," Abe told the LDP's convention in Tokyo. But he stopped short of mentioning detailed procedures or a timeframe. The party's action plan endorsed at the convention merely touched on its push to realize a first-ever amendment to the 1947 Constitution in one paragraph in its preamble, although it dedicated a separate chapter to the subject last year. "We are committed to igniting public interest and paving the way toward amending the Constitution so that it conforms to the current time," the annual strategy said. The conciseness apparently reflects the reluctance of party members particularly in regional chapters to highlight the divisive topic in the upcoming elections. The party did not present its own proposals to the Constitution commissions of the two houses of the Diet during an extra parliament session last year, although Abe, elected for his third and last three-year term as LDP president in a party election last September, has maintained he wants to revise the supreme law by 2020. Currently, pro-constitutional reform forces have a two-thirds majority in both Diet chambers, meeting the requirement to initiate the amendment process. Any proposals must eventually be approved by a majority in a national referendum. Abe had hoped that the LDP's proposals put together in March last year would be submitted during the extraordinary Diet session that started in late October, and for further discussions to be held with opposition parties. But intensifying confrontation between the ruling and opposition parties over a bill aimed at accepting more foreign workers into Japan made it difficult for lawmakers to engage in full-fledged and highly-sensitive constitutional discussions. As for a series of local government elections in April and the House of Councillors election in the summer, the annual strategy for 2019 urged candidates to strengthen their support bases to clinch victories even if they face unexpected circumstances. 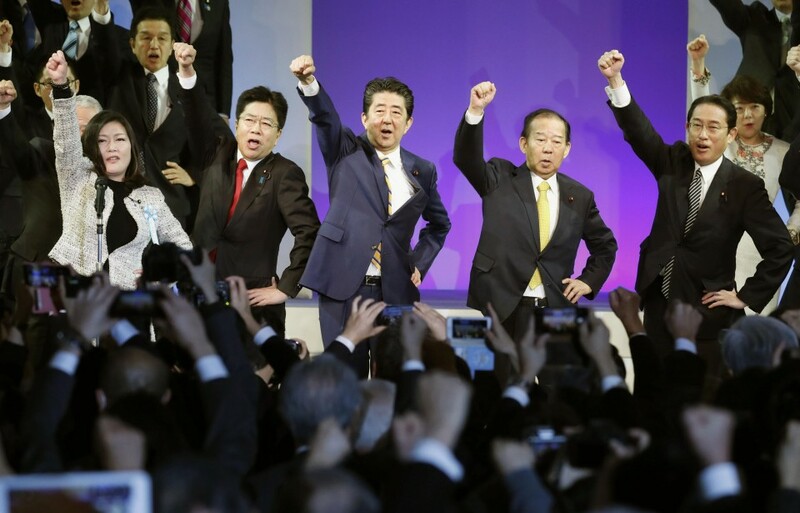 "Local assemblies are the foundation of the LDP," Abe said in his speech at the convention. On foreign policy, Abe reaffirmed his resolve to advance negotiations with Russia toward concluding a postwar peace treaty, which has not been signed due to a territorial dispute over a group of islets off Japan's northernmost main island of Hokkaido. Among domestic issues, the prime minister apologized for the labor ministry's release for years of faulty jobs statistics that resulted in the underpayment of work-related benefits to tens of millions of people and the undermining of trust in the accuracy of government statistics.